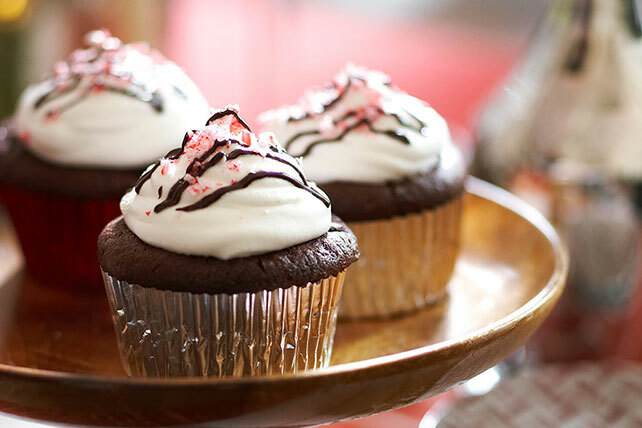 Crush up some candy canes to make festive Chocolate-Candy Cane Cupcakes! These adorable candy cane cupcakes are perfect gifts or holiday party desserts. Chop 4 oz. chocolate; set aside. Beat next 6 ingredients with mixer until blended. Stir in chopped chocolate and 2 Tbsp. candy. Spoon into 30 paper-lined muffin cups. Bake 20 to 23 min. or until toothpick inserted in centers comes out clean. Cool cupcakes in pans 10 min. Remove from pans to wire racks; cool completely. You'll know it's a special occasion when you get to enjoy a serving of these festive cupcakes. For best results, do not crush the candy too finely. A medium crush provides the perfect touch of crunch and flavor to both the cupcakes and frosting garnish. Prepare using crushed starlight mints or other hard peppermint candies.